I'd like to introduce you to my two GSD's. Trigger and Trooper. Trigger sports the red collar, weighs 72 lbs, and is the trouble maker of the pair, Trooper sports the blue collar, weighs 68 lbs, and seems destined to be the 'guard dog'. Both littermate males, just over 7 months old, have an amazing level of intelligence, courage, and of course mischief. Their 'career' paths have yet to be determined, but I would like to put their noses to good work; either ground search, or cadaver, explosives, who knows. I have been in the Military for close to 30 years, and during that tenure have owned 4 GSD's, and have had the privilege to interact with the Military Dogs, most of which were GSD's. They were a Godsend in Afghanistan for two reasons; their ability to detect the EID's, and there effectivness of boosting the troops morale!! This particular picture is from when the boys were around three (3) mth's old, showing off their new doghouse. Great story. Just love German Shepherds. 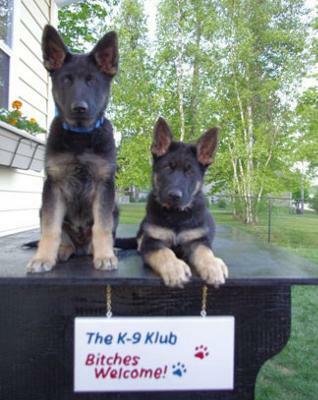 Thsoe pups look like they mean business at such an early age, I love it!